Adds a callback to call when the object changes. Returns the datum's age. Used for caching. Initializes internal data. called by derived objects May be set to NULL if there's no parent. Calls all the registered callbacks. Called by derived objects when the data changes. Pointer to the parent LLTrustNetAvatarData object Used to retrieve data about the avatar the information is associated to. Represents a piece of data retrieved from the TrustNet server. Definition at line 178 of file lltrustnet.h. Definition at line 182 of file lltrustnet.h. Definition at line 73 of file lltrustnet.cpp. Definition at line 193 of file lltrustnet.h. Definition at line 195 of file lltrustnet.h. Referenced by LLTrustNet::getScoreData(), and LLTrustNet::getScoreState(). 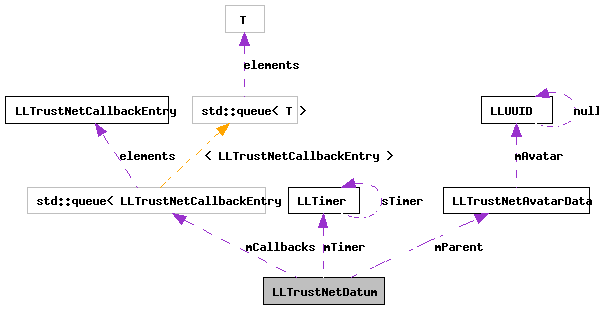 Definition at line 79 of file lltrustnet.cpp. References LLTrustNetAvatarData::getAvatar(), mCallbacks, mOperation, mParent, and LLUUID::null. Definition at line 206 of file lltrustnet.h. Definition at line 199 of file lltrustnet.h. Referenced by LLTrustNetScore::LLTrustNetScore(), and updated(). Definition at line 218 of file lltrustnet.h. References mTimer, notify(), setState(), LLTimer::start(), and TNS_RETRIEVED. Definition at line 198 of file lltrustnet.h. Definition at line 222 of file lltrustnet.h. Referenced by addCallback(), and notify(). Definition at line 220 of file lltrustnet.h. Referenced by LLTrustNetScore::LLTrustNetScore(), and notify(). Definition at line 231 of file lltrustnet.h. Referenced by notify(), and setParent(). Definition at line 225 of file lltrustnet.h. Referenced by getState(), and setState(). Definition at line 223 of file lltrustnet.h. Referenced by getAge(), and updated().